How can NACEDA members support organizing and community empowerment efforts by local community-based organizations? Community development can transform neighborhoods and enhance lives. It creates opportunities for people who have been historically underserved, and those who suffer from discrimination and disinvestment. However, if community residents aren’t part of the community development process, they may continue to be overlooked, their greatest needs may remain unmet, and any efforts to effect change may be less successful. A vibrant organizing ecosystem can spark community involvement, particularly during times of political and social uncertainty. For that reason, community development networks should find ways to increase their support of organizers – even when they have little control over where those organizing efforts might lead. While NACEDA members are typically a step removed from on-the-ground community organizing efforts, they play an active role in providing training, fundin,g and support to organizers. Yet, when community empowerment is done right, there is a cost. Once a community is organized, NACEDA members relinquish control over what issues organizers choose to rally around. That loss of control is a reality that NACEDA members must embrace, particularly in a divisive socio-political climate where organizing is more important than ever. It’s easy to see why a community development network might hesitate to embrace community organizing efforts wholeheartedly. While organizing can create buy-in and engagement from the community, there’s no guarantee that the community’s goals will align with broader policy goals. When people experience the power that effective organizing can yield, they may decide to use that power to further their own goals, some of which may be counter to NACEDA members’ goals. The Washington alliance understands this dilemma all too well. They spearhead the Resident Action Project (RAP) a statewide network of people in Washington state who have experienced housing injustice first-hand and organize against it. A lot of the alliance’s organizational members are housing providers, and some were initially uneasy about RAP’s work, Myers says. “There is some fear about what it means to have your tenants be organized,” says Myers. What if those tenants organize against you? Is your support of organizers also serving to undermine your community development efforts or make your job more difficult? While those concerns are not unfounded, now is the time to put those fears aside. The need for organizing and the changes it can inspire far outweigh the chance that organizers will turn against community development organizations. Societal threats to community development are too great. Anyone doubting the need for community organizing need only pick up a newspaper, catch an hour of cable news, or spend a few minutes on Twitter. Under the Trump administration, new and proposed policies could impact federal funding for community development, as well as the economic health and emotional well-being of the vulnerable communities that NACEDA members serve. “We used to have national leadership that would say, ‘We have to support and lift up everyone in this country.’ Now we have national leadership that explicitly says, ‘We really don't care if people are left behind and, in fact, we would prefer it if certain people were excluded,’” says Gloria Bruce, executive director of the East Bay Housing Organizations (EBHO) in Oakland, California. For that reason, community organizing efforts are more important to the success of community development than ever. When people in a community are systematically denied certain rights and resources, the only power they have is in their numbers, says Sarida Scott, executive director of Community Development Advocates of Detroit. When people organize and speak in a collective voice, their actions can influence public opinion and lawmakers. At the same time, some communities are so afraid to speak up for themselves that they need organizers to rally others to speak up for them. Bruce recalls a partner organization that services the Latino community lamenting that deportation fears made it more difficult to get people to come out to rallies this year. Gordon Chin, founding executive director of the Chinatown Community Development Center wrote last year in an article for Shelterforce that community organizing is a way for community development organizations to think “less like an ‘industry’ and more like a movement,” which is necessary during the Trump Era. So, the question remains: How can NACEDA members strengthen their existing connections to the organizing community and help create an ecosystem where organizing for community empowerment thrives? Being willing to cede control of the outcome and put organizers’ needs first is big part of the answer. Organizing is a very specific and skill-driven process, says Scott. NACEDA members can help community groups and energized residents learn some of these skills, even though they can’t control how those skills will eventually be used. Network leaders are in a unique position to elevate the organizing community and help organizers achieve more than they might have thought possible. For the last four years, EBHO has held a Leadership Academy for current residents of affordable housing. “We do a series of trainings and workshops over the course of a couple of months and we emphasize things like the basics of community organizing, the different models and what you can do to get people out,” Bruce says. When senior residents needed a new stop sign to prevent accidents at a dangerous intersection, EBHO showed them how to organize an effective letter-writing campaign and escalate the issue. NACEDA members can also expose their members to the most knowledgeable experts in organizing, in person and via webinars and conference calls. For example, the New Jersey network brought in staff from Midwest Academy, a training school for progressive organizers, for a five-day training session. NACEDA members can use their clout to provide local organizers with media exposure. When the New Jersey network found out that several towns had high rates of childhood lead poisoning, they organized a series of press conferences in conjunction with local groups and created buzz about local organizing efforts via social media. Then there is logistics support. BLDG Memphis helps smaller organizing efforts in the community get off the ground through its Mobile Porch, which is literally a front porch built on a trailer that can be hauled around to fairs, festivals, and community events. Community groups can use it to mobilize residents to become invested in an important issue. Not only does it serve as an attention-getter, but it has built-in tools, such as tablets, that let groups conduct surveys or capture video and photos. “Giving people a sense of their own power and making sure they understand that legislators have an obligation to at least hear them out is a very powerful thing, particularly for folks who are doing it for the first time,” Berger says. Another way NACEDA members can strengthen the organizing community is by building community alliances. “We do a lot of coalition work,” says Bruce. However, “a lot of the community-based organizations or organizers I know really don't like being approached with solutions that are already figured out for them,” Bruce notes. Instead, they may be open to a conversation about how NACEDA members can help them reach a goal they’ve already set. It’s also important to make sure a local organization’s organizing style is compatible with a NACEDA member’s mission. For example, EBHO’s Interfaith Communities United program uses faith-rooted organizing to develop relationships with interfaith and inter-religious organizations and mobilize church members to advocate for housing justice. BLDG Memphis’ role is to be a convener for smaller, local community-based organizations, says executive director John Paul Shaffer. They can also provide infrastructure and an administrative backbone. Funders want to know that there's a history and a track record for community-based efforts and BLDG Memphis can provide that track record when it partners with local groups who are doing organizing on the ground, Shaffer says. One way they’ve done that is through their participation in the Strong, Prosperous, And Resilient Communities Challenge (SPARCC), a three-year initiative to invest $90 million in community organizing efforts. BLDG Memphis is involved determining what types of local community projects and organizing efforts SPARCC will fund. Not only are NACEDA members supporting local organizing efforts, some are moving into the role of mobilization – taking the lead in bringing people together to initiate change that may or may not have been decided with community input. Some NACEDA members are adding community organizers to their staffs. Bruce has two full-time organizers and Scott is contemplating hiring the organization’s first organizer. Funding may be a challenge for NACEDA members who are increasing their organizing efforts. If they spend more money on organizing, they must take money from somewhere else. To keep costs down, Scott is considering sharing the organizer she wants to hire with a partner organization to split the salary costs. A big part of supporting community organizing efforts is showcasing success stories – something NACEDA members are particularly well-suited to do. Networks can tout members’ community wins via social media or highlight organizing efforts that have affected change at their membership meetings. The New Jersey network, like many NACEDA members, showcases ways that members are supporting local organizing efforts in their newsletter, website, and social media. “Our objective is to help people learn from each other,” says Berger. When community development organizations see other organizations just like their own successfully engaging residents and standing up for the values they believe in, it fosters new ideas for bringing other organizing efforts to life. That’s how the Washington alliance convinced its members that organizing tenants is a good thing despite the fact that doing so creates uncertainty. They highlighted examples of how empowering tenants has helped to push their public policy agenda. They showed that when the residents win, the housing providers win. At the same time, a strong organizing community can serve as a check to help community development organizations stay true to the mission of making life better for the communities they serve. “If one of our members has bad practices that are harming their tenants and their tenants organize after they’ve learned skills through our program, then more power to them,” Myers says. If a community development organization can’t get past their fear of organizing, they must at least put that fear on the back burner and focus on what can be accomplished through an empowered community. Organizers can help NACEDA members strengthen their own advocacy positions. This year, East Bay Housing Organizations is advocating for a ballot measure that would put more money in California’s state budget for affordable housing. Bruce is looking to Leadership Academy participants to support their efforts. “We’re hoping that because of the training they’ve had, they’ll feel confident in how they can talk about policy issues and they will be ambassadors and volunteers to spread the word on this campaign,” she says. Tamara Holmes is a Washington, DC-based freelance journalist and ghostwriter who writes about community development, money and small business. Her work has appeared in Shelterforce, USA Today, and AARP Bulletin. Wow! It was so exciting to read in Tamara Holmes’ essay about the many different ways CDC associations are supporting and encouraging community organizing. Here at the Massachusetts Association of CDCs (MACDC) we are continuously trying to improve the ways we support the organizing our members do and help members who don’t to it begin to organize. MACDC recently went through a strategic planning process in which we identified “building the power and voice of lower income people and people of color to shape the future of their communities and their own lives” as one of our organization’s priorities. This means that MACDC will have to help our members embrace community organizing and commit financial and human resources to organizing. Committing to organizing and making it a priority is key. During our strategic planning process, MACDC convened a task force of organizers and executive directors from CDCs who do organizing. This group recommended launching a working group to take a deep dive look at the state of organizing in the CDC sector and how it can be strengthened. We already regularly convene a peer group of CDC organizers so that they can learn from and support each other and provide organizing trainings through our Mel King Institute. But we want to take those efforts to the next level. Most importantly we want to create a “culture of organizing” within MACDC; an organizational culture in which organizing is valued and expected. We want to work to make community organizing and community leadership development holistically integrated into our members’ structures. The CDCs that do that tend to be the most successful. And as Tamara pointed out, sharing success stories is important – the first step in making a commitment to organizing is learning how it will make a CDC strong. Pam Bender is senior organizer for the Massachusetts Association of Community Development Corporations. 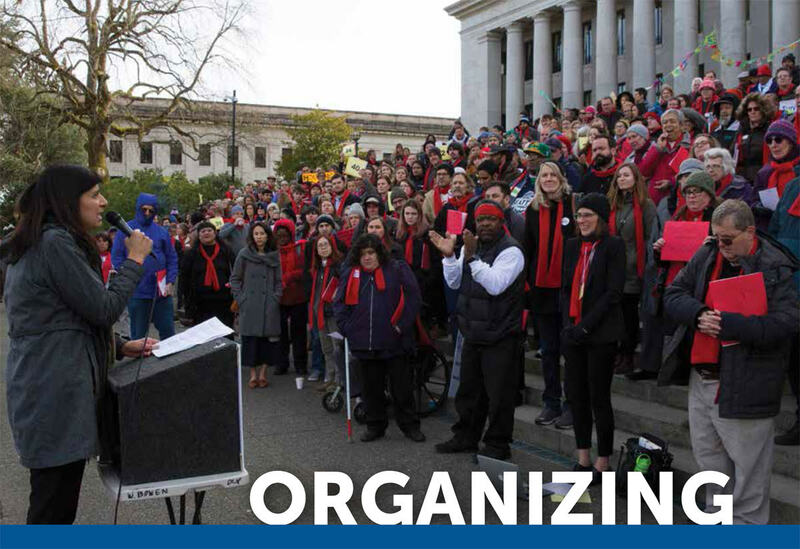 All organizing is about identifying and training community leaders, and empowering them to make decisions, set strategy, and take action on those things they determine to be important in their community. As community development practitioners, we should be as rigorous about the work of training and developing community leaders – including establishing and using measures for that work’s effectiveness – as we are about our bricks and mortar and service delivery work. One concrete measure of a CDC’s willingness to engage in real community organizing is whether the CDC is willing to take on and lead efforts that are not necessarily in the immediate business interest of the CDC, but are important to the community’s overall development. An example of this would be a CDC’s willingness to help organize a campaign for an Inclusionary Housing zoning ordinance to create affordable housing, rather than only organizing residents in support of the CDC’s own affordable housing developments. We can all learn a lot from both past and current experience. At the Massachusetts Association of Community Development Corporations (MACDC), we have the rich history of having run the Ricanne Hadrian Initiative for Community Organizing (RHICO) for a decade beginning in 1997. (I am a board member of MACDC and helped establish RHICO.) RHICO helped change the CDC culture in Massachusetts and provided training and early organizing experience to dozens of young organizers. At MACDC, we’re about to take a fresh look at the state of community organizing practice among our CDCs – it’s that important to our work – and we would implore our fellow CDC associations to do the same. Danny LeBlanc is CEO of the Somerville Community Corporation in Somerville, Massachusetts. My inspiration for joining the world of community development is that it started as a movement: residents and neighbors organizing to take control of the future of their communities. The field of community development has made vast strides over the decades in the technical know-how and capacity both to do “bricks and mortar” development and to deliver impactful services to their communities where it is so badly needed. However, without a deep connection to their local communities and commitment to organizing and activating residents to seize their power as change makers in neighborhoods, community development is only partially fulfilling its mandate. In the current political and social landscape, we must be more than just non-profit real estate developers. It is of urgent necessity that community development (re)claim the mantel of building resident and neighborhood power. Detroit has a long and storied tradition of activism and organizing to achieve landmark progress in civil, human, and labor rights. However, in the current environment there is a marked separation between community development organizations (CDOs) that work in specific neighborhoods and the grassroots advocacy and organizing groups working citywide on issue campaigns around housing, poverty, democratic participation, and inequitable development. This is not uniformly true for every CDO and neighborhood group, but many put their energy towards working within the current power structure to push incremental change and focus on physical development – rather than building and training a base of organized residents. CDOs in Detroit are rarely the vehicle for turning out residents for public comment at City Council meetings or to lead public campaigns for policy change. There can be many explanations for this: organizing isn’t easy and requires specific skills and approach to the work. Most CDOs are already overworked, under-resourced, and lack capacity to add community organizing as a core activity. There can also be a reluctance to being confrontational, or seen as adversarial or too “radical” to government officials, funders, and corporate partners on whom CDOs rely to advance their mission. Additionally, many practitioners have become more comfortable framing their work in terms community engagement rather than organizing. That’s not to knock engagement – I love good engagement, it’s in my job title. But we should also know the difference between engagement and organizing. Let’s recognize the limitations of an engagement model as the foundation for building power. CDC associations can and do play an important role in supporting advocacy and organizing on behalf of their members. CDAD regularly provides resources on policy issues at the local, state, and federal level, participates in coalitions advocating on a range of issues affecting our members, and connects our members to larger movements for social justice and equity both local and national. We also play an important role in being able to step out and advocate on issues on behalf of our membership and are willing to weather more political blowback than our individual members. However, by our nature we are also a step removed from grassroots organizing with residents. We can organize our members around issues and have an impact – but systematic change for just and equitable development requires developing a broader base of residents beyond CDO and neighborhood group leaders. That is what local CDOs could do. Our members already have the connections and relationships with residents that are necessary for building power. The question I am grappling with is: how can CDC associations help to shift their perspective about their role in organizing and building up residents to lead and drive change? City-wide issue advocacy groups don’t often have the same kind of long-term relationships and trust with residents as a neighborhood-based organization. Local CDOs have a great opportunity to connect their residents to the issues and policies that affect their daily lives and then activate them into a force that elected officials and decision makers ignore at their own peril. And CDC associations should orient their work to support local CDO organizing capacity and efforts. Aaron Goodman is community engagement manager for the Community Development Advocates of Detroit (CDAD). • Has professionalizing the real estate development aspect of our field forced us to sacrifice a commitment to organizing? • How can advocates balance a need to mobilize on specific issues vs. longer-term, community-oriented organizing? • How could we use the work we’re doing on real estate development to mobilize and empower community residents?